Casa Bertrand, Ta’ Qali, which was demolished to make way for the airfield. The Ta’ Qali runway being levelled, with Torri Cumbo in the background. The No. 3 Royal Australian Air Force Squadron arrives at Ta’ Qali from Zaura in Libya on July 9 but moved on to Luqa on July 13 and then on to Sicily after bridgeheads were established there. 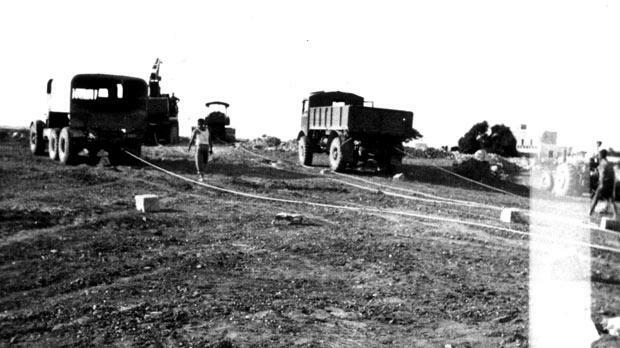 The 5051 Airfield Construction Squadron were the aerodrome builders par excellence on the Maltese islands, along with various other civil contractors and military authorities. By the end of June 1943, Luqa Aerodrome had its northwest-southeast runway (today’s longest runway 13/31) extended from 1,400 yards to 1,750 yards, the northeast-southwest runway (05/23) was lengthened from 800 yards to 2,000 yards with grated strips 15 yards wide on either side of the runways. Three marshalling yards were constructed along with taxi-tracks to 60 per cent of the airfield. 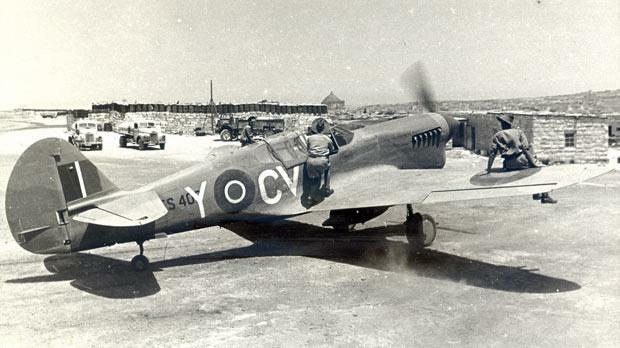 Eleven RAF squadrons were based at Luqa during Operation Husky, these were 23, 55, 69, 108, 113, 219, 221, 223, 256, 272 and 683 Squadrons, the latter being the only Spitfire squadron, with the rest operating the ‘heavies’, namely Mosquitos, Baltimores, Beaufighters and Wellingtons. Their crews were hosted at several hotels such as the Melita Bay and United Services Hotels in Sliema as well as the Meadowbank Hotel. Several properties were requisitioned at Ta’ Xbiex, Sliema and Balluta Buildings in St Julian’s. The major civil government property hosting the air crews was the St Vincent de Paule residence, then known as the Poor House. All of these were returned to their rightful owners by the end of 1944 after a large concentration of buildings and Nissen huts were built at the Luqa, Siġġiewi and Safi camps. For several years before they were completed, Qrendi and Safi airfields were pounded by enemy bombs after they were disguised as ‘Q’ (decoy) airfields. Qrendi even had a team of army personnel on stand-by to switch on the ‘runway lights’ so as to divert the bombing raids on to its empty grounds. Qrendi Airfield was completed with two runways 1,200 yards long and 50 yards wide, including dispersals for three Spitfire squadrons (185, 229 and 249), and officially opened on November 10, 1942, by Air Vice-Marshal Keith Park. The squadrons had returned to Ħal Far by September 24, 1943, after which the station was reverted to an emergency landing field. Safi Airfield was opened by the ultimate ‘Airfield Inaugurator’, AVM Park, on May 15, 1943. Safi Airfield was raised to a status of an aerodrome after spending three years in the shadow of its elder sisters – Ħal Far and Luqa – by connecting them with specially widened public roads that served as dispersal points for aircraft returning from raids. Safi had three Spitfire squadrons based on its grounds during Husky (111, 126 and 1435) and an RAF Kittyhawk squadron (112) between June 7 and October 27, 1943. 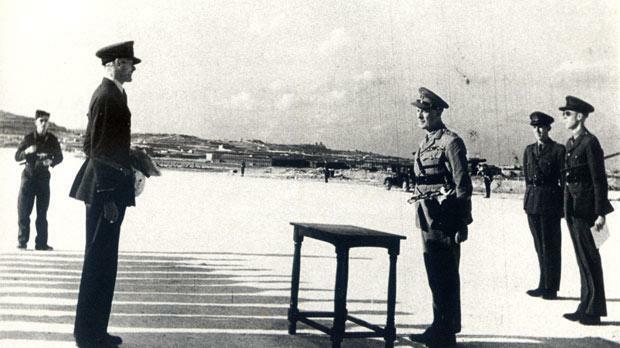 King George VI inspected the parade provided by the Maltese, British, Basuto and Mauritanian troops that had been building it in the hot Maltese sun when he visited the station on June 20, 1943, on his short visit to Malta. On November 8, 1943, RAF Station Safi was closed as an operational flying airfield, but not before having the distinction of welcoming such VIPs as Generals Bernard Montgomery and Dwight Eisenhower (who was the overall Commander of Operation Husky) and Field Marshal Sir Harold Alexander (his deputy) and even a captured Bf 109G-2 (Black 13 of 2/JG 27) brought over by the Commanding Officer of 1435 Squadron, Squadron Leader R. Webb, during the Sicily Invasion. 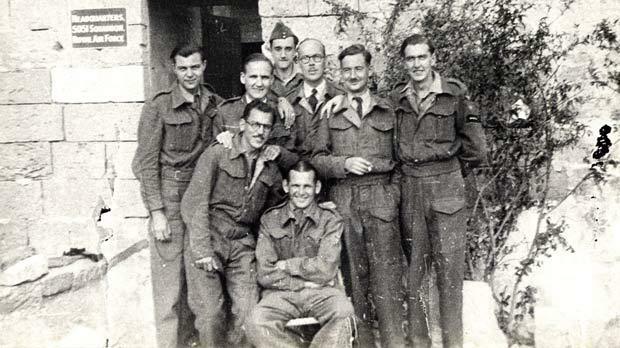 Safi camp became a prisoner-of-war camp and also hosted much of the RAF Luqa air crews that vacated the requisitioned properties. On June 27, 1946, Safi was converted to an aircraft maintenance unit up till the departure of the British Services in 1979, with aircraft being towed out of Luqa station into its grounds by means of the wartime taxi-tracks turned to roads. Safi’s runway was incorporated in Runway 14/32 rebuilt in 1977, thus being swallowed up yet again by its bigger sister station. Ta’ Qali airfield had started its operational life in 1935 as a ‘grass strip’ but was more of a dust bowl than anything; however, by the end of June 1943, a hard surfaced runway 1,200 yards long by 50 yards wide and having a 15-yard-wide graded flight path on either side had been constructed. This eliminated the usual practice of the airfield being turned into a quagmire of mud when the rains set in. During Husky, Ta’ Qali Airfield (which was known as ‘Ta’ Vnezja’ by the locals, ‘Takali’ by the British and ‘Ta Venezia’ by the Italians) had a combined force of Royal Airforce, Fleet Air Arm (British Navy Aircraft), USAF and Royal Australian Air Force squadrons based for a short stay. The other airfield worth mentioning is the venerable Ħal Far, which was Malta’s first proper aerodrome on ‘Terra Firma’ after the Marsa landing grounds were given back to the polo horses after some use during and after World War I. Ħal Far had been inaugurated by the then Governor, Field Marshal Lord Plummer, in January 1923. By the end of June 1943, the northwest-southeast (31/13) paved runway was extended by a thousand yards from the grass strip, making it a total of 2,000 yards long by 50 yards wide and the usual 15-yard-wide flight paths on each side. The paving of the East-West (09/27) runway at 1,600 yards long was only 15 per cent ready. Also constructed by that time were additional blast pens, resurfacing of their link-ways, an underground control administration block and a protected type of control tower above ground. Several difficulties were encountered during this hectic construction phase such as lack of fuel to feed the Macadam plants, which was countered by using wood from destroyed buildings. The crushing plants were too small, and the large labour force was made to work very hard. The amount of tarmac required to surface 8,330 linear yards at 50 yards wide with an 8” depth was incredible. This amounted to 2.5 million cubic feet of bitumen that Macadam produced in one year under war conditions, with a primitive plant and incredible hardships endured by all. Added to this must be the 15-yard-wide graded flight paths on each side of the six hard-paved runways on Malta, the 1,200 yard long by 80 yard wide oil-bound runway at Safi and the two salt-water-bound strips at Gozo. Over 200 aircraft pens averaging 600 cubic yards each were constructed. Most of these and their link-ways had to be treated with crude-oil dressings by petrol tankers converted to sprinklers to counteract the hazard of dust being ingested by air-hungry aircraft engines. The ancillary RAF installations strewn around the islands also required – and got – their own particular attention. The construction of the various radar stations, all in inaccessible parts of the island, erection of several 200-foot-tall timber and steel communication masts at RAF Siġġiewi, Wied Rini, Bengħajsa, Dingli and Nigret all had to be catered for, as well as the huge challenge required to cater for and accommodate the thousands of personnel arriving for the invasion process. 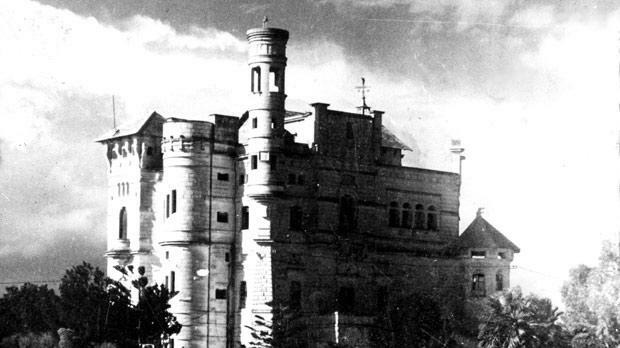 Several camps were set up and various properties – many of them repaired from war damage – were requisitioned. Food, ablutions and bedding put a strain on the local authorities, especially considering the fact that proper rank segregation had to be kept. Officer’s messes for the fussy but all-too-important pilots had to be found. Also motor transportation had to be dealt with, and thousands of bicycles were brought over. To all of this pandemonium had to be added the immense needs of the army and navy, which also had their own particular requisites and traditions to be withheld. During the summer of 1943, Malta was one of the busiest islands – military-wise – in the whole world. All this construction activity leads one to the conclusion that the Allied commanders did not want to be caught with their pants down, such as happened in Malta at the start of the Mediterranean war back in June 1940. The lessons learnt at Crete were put to good use – even leading to overprotection phobia, because as things worked out, no enemy attacks were made on the Maltese aerodromes during the launch of Operation Husky. Barely had Malta undergone its Second Siege during 1942, where its occupants – Maltese and British alike in the same cauldron – were being starved to death with the lack of supplies and on the brink of surrendering, that it was re-armed with no fewer than six aerodromes and serving as a launching pad to invade its erstwhile superior enemy. In one year, Malta was turned from a sinking passenger ship to an “Unsinkable aircraft carrier” – as British Premier Winston Churchill so aptly nicknamed it. The writer wishes to thank the National War Museum Association for their photos, Ray Polidano of the Malta Aviation Museum Foundation at Ta’ Qali and Richard Caruana, Malta’s foremost aviation history expert, for pointing out the position of Xewkija’s Airfield runways. The author is researching the history of the airfields of the Maltese islands for an upcoming publication and would be grateful for any readers’ contribution to aid him in his research. He may be contacted on e-mail 203sqn@onvol.net or on 9947 0536.